Alibaba Group Holding Limited operates as a holding company. The Company provides internet infrastructure, e-commerce, online financial, and internet content services through its subsidiaries. Alibaba Group Holding offers its products and services worldwide. Why exactly did Chinese stocks like Alibaba, Baidu (NASDAQ:BIDU), iQiyi (NASDAQ:IQ), JD.com (NASDAQ:JD) and others fall out of favor so quickly? Admittedly, no company on this list is fundamentally perfect. But neither did they see any benefit when the U.S. and China started levying tariffs against one another, escalating a trade war between two of the world’s largest countries. However, China appeared more vulnerable than initially believed and its economy has suffered markedly as a result. The U.S. hasn’t gone unaffected, but the economy has handled the escalating trade war much better than many thought. That’s left America in a favorable negotiating spot and as the two counties inch toward a deal, Chinese equities have been rallying. The knife cuts both ways. Any negative headlines or rhetoric about a trade deal falling apart will mean bad things for BABA stock and its Chinese compatriots. But so far, the sailing has been pretty smooth. Should a deal get done, these stocks will have a huge overhang lifted from them, allowing the stocks to be valued on their fundamentals rather than sold down due to country-wide concern. That brings us to fundamentals, which are very strong in the case of BABA stock. Weighing in with a $442 billion market cap, Alibaba is no small company. It’s slightly larger than its domestic rival Tencent (OTCMKTS:TCEHY) and just a bit smaller than Facebook (NASDAQ:FB). Still, Alibab’s growth is virtually unrivaled, given its size. What other $400 billion-plus market cap company is set to grow revenue more than 30% this year? With that market cap threshold, the closest we get are Alphabet (NASDAQ:GOOGL) and Amazon (NASDAQ:AMZN), which are forecast to grow sales just under 20% this year. Alibaba though? 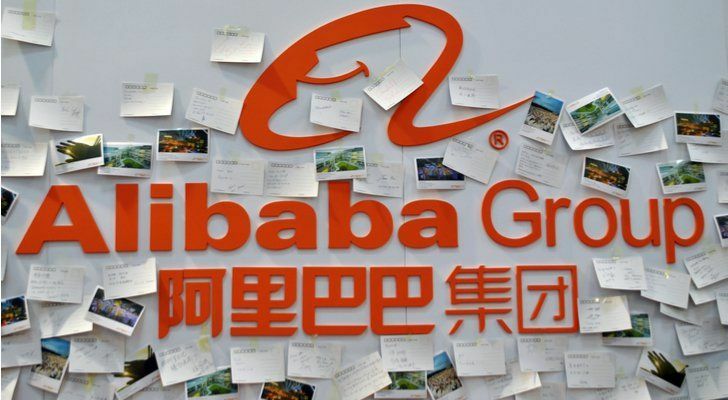 Analysts are looking for 54% revenue growth to $55.5 billion in fiscal 2019, the last quarter of which Alibaba will report in May. Currently, analysts estimate that the company will grow sales another ~36% in fiscal 2020, vastly outpacing its mega-cap peers. The downside is that revenue growth is outpacing earnings expansion, which would suggest some margin pressure for Alibaba. That said, analysts are looking for 14.5% earnings improvement this year to $5.43 a share and an acceleration in fiscal 2020 to 23%. BABA stock trading at 31 times this year’s earnings isn’t exactly cheap, but where else can we find this growth at this size?